All couples lead around anticlockwise holding both hands (8b), turn in place, keeping hands at waist level. Lead clockwise (6b) and dance facing partners (16b) (2b), gents facing out, and ladies facing in. 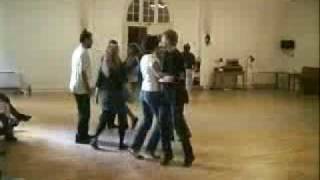 All couples swing in céilf hold. All face partners, take right hands, dance on the spot (2b), chain all round (12b) and dance the last two bars facing partners. All take inside arms instead of hands in the chain. Alternate instructions from Mick Mulkerrin via Bill Lynch is for partners to face each other, take right arm hold and chain round to meet partners in the opposite place and batter 2 bars in place, chain on back to place and batter the last 2 bars at home. Top ladies chain. They take inside arms in the centre, turn clockwise under opposite gent's left arm while they both turn anticlockwise, chain in the centre again and dance under their own partner's left arm, going anti-clockwise around him while he faces in. As in the first figure. Top gent and opposite lady change places, passing right shoulder to right, turn clockwise at the opposite side (4b), pass back right shoulder to right (2b) and turn anticlockwise to face each other in the centre (2b). Top gent and opposite lady swing in the centre, finishing the swing with their backs to their own positions. Second top couple swing, moving to the centre (8b). First couple with the gent's right arm around the lady's waist and her left hand on his shoulder, advance to meet them during the last two bars and the second lady moves from the swing to join them in a line of three facing her own partner. The top gent now has a lady on each side. All retire, advance, retire again and advance to form a circle of four in the centre. Top couples swing in the centre (6b), breaking back to place from the swing (2b). Side couples swing in place at the same time. 1st sides leading. First side couple are left of first top couple. Circle, advance and retire twice. 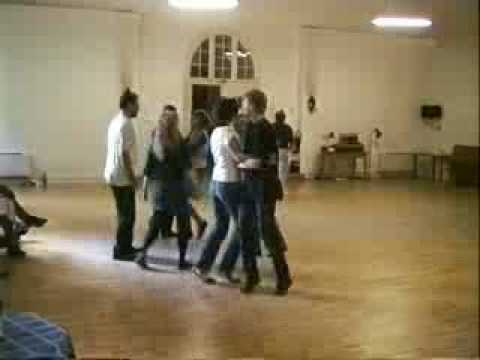 When retiring the second time, gents move left and ladies move right, all couples taking their corners into waltz hold. Dance clockwise, turning clockwise twice, to finish in the ladies' original positions. Repeat until back in place with their own partners.